The importance of Information Communications Technology (ICT) to the development of rural areas in Europe was the focus of an ENRD seminar held in Brussels, on 10 February, 2011. The event entitled "ICT and rural areas: building the knowledge society at grassroots level" provided a useful platform for discussing the implementation of ICT policies in rural areas and how this has been implemented in different Member States. The seminar, which was attended by around 140 ICT and rural development stakeholders, examined the role of rural development policy concerning broadband infrastructure and its utilisation. The seminar also focused on reviewing the needs of rural areas, as regards the current ICT requirements of agriculture, as well as those of the food industry and rural areas generally. The seminar also included issues relating to the new Digital Agenda for Europe and the EU Broadband Strategy. A focal point for the event was the sharing of good practice regarding ICT projects in rural areas and collecting ideas for future rural development policy and “post-2013” discussions. In general, the seminar underlined the importance of ICT as a cornerstone for the development of rural areas. Adrian Neal, from the ENRD Contact Point said that the event “truly demonstrated the breadth and diversity of the support already being provided by the EAFRD”. However, it was noted that there is a real need for more investment in ICT infrastructure in rural areas and for greater incentives for the rural population to use new technologies. Exchanging information and presenting examples of different types of RDP activity that have received EU co-finance from the European Agricultural Fund for Rural Development (EAFRD) is an important aspect of the ENRD’s work. 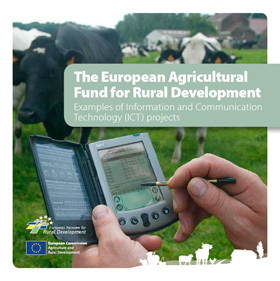 The recently published EAFRD Projects Brochure highlights a diverse range of innovative ICT projects from across the EU. All of the projects featured in the brochure have been submitted by NRNs as interesting rural development initiatives and useful contributions to building the ‘knowledge society’ in rural areas.